With the start of the WCHA Final Five, we take a look at the opening round match-ups and some notes going into each game. We will continue to have preview and summary notes of all the Final Five games along with more in-depth UMD coverage including StatPacks. We here look forward to some great Hockey in the WCHA Final Five! Predictions by Fiskness, Notes by Craig. The first round of the WCHA playoffs had some very entertaining games and of course there was an upset. I picked the upset wrong, and I should have seen it coming. The two previous weekends where UNO got swept showed that they were the team that hit the wall. The Huskies of MTU were just toying with and playing dead against the Tigers in the last weekend of the regular season. Yes, the Huskies have now gone 0-28 at games in Colorado Springs during the regular season, but they have now won four of the last five playoff games there. With all of the possible scenarios for the WCHA playoff champion I will only pick the Thursday winners and then make a guess at the playoff Champion. Denver and Michigan Tech (2:07): The Huskies bounced back after getting swept by the Tigers the previous week for the about face. They are a much improved skating team and are should be able to keep pace with all of the opposing teams in the WCHA playoffs. This season the Huskies took 3 points out of 4 in the only meetings with the Pioneers in Houghton. The Pioneers are very talented team that has found some consistency in net now with two solids goalies. It will likely be Sam Brittain starting as the Pioneers responded with back to back wins on Saturday and Sunday night hosting Wisconsin to get into the Final Five. I am picking Denver to win in a close one. I wouldn't be too surprised if Tech did win and they play UMD tough. Whichever team wins will be a good match-up with the Bulldogs. Tech won the season series 1-0-1 way back in October at home. Both teams played in Colorado last weekend prior to making the trip to Saint Paul. Unlike MTU, Denver had to play Sunday and take it to OT before prevailing. 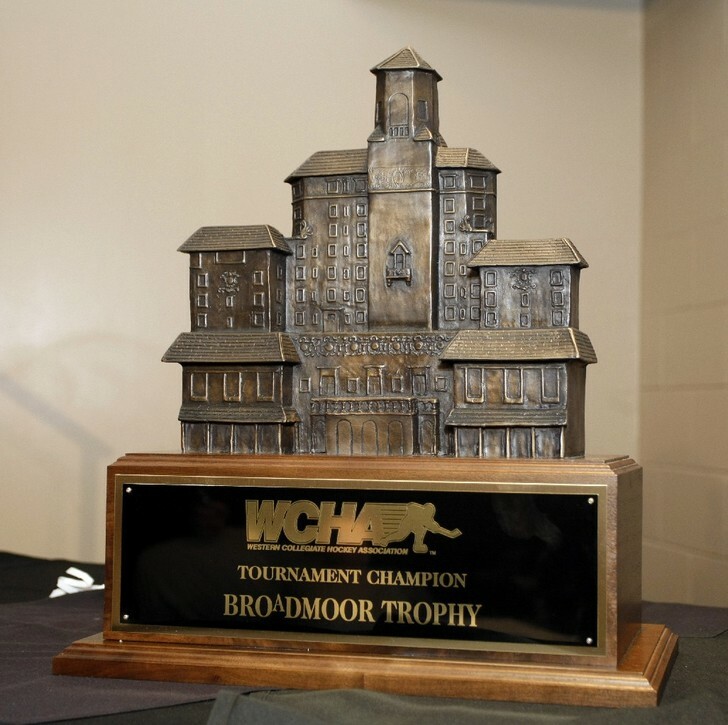 Denver is likely to be in the NCAA Tournament regardless of their record this weekend while MTU has to win the Broadmoor Trophy, given to the WCHA Playoff Champion, to continue to the NCAA’s. If MTU were to make the NCAA Tournament, they are the host school in the Green Bay Midwest Regional and would be placed there. North Dakota and Saint Cloud State (7:07): Mike Lee and the Huskies appear to have saved their best hockey for the right time of the year, but unfortunately they are playing the UND Men's Hockey Team who also appears to be peaking right in time for the playoffs. Both teams have solid defense with good goal tending. The top line of SCSU should be able to hang with North Dakota, so the game will probably turn into a battle of turnovers. I think that Cinderella Story for the Huskies will end with a close North Dakota win. I like both of these teams in a match-up against the Gophers and I think the Gophers playoff chances could be stopped Friday night. SCSU and UND are WCHA “rivals” so they played four times prior to this meeting. The teams split both series during the regular season with SCSU winning both Friday night games and UND winning the Saturdays. North Dakota is very likely in the NCAA Tournament regardless of their Final Five games while Saint Cloud needs to win the Broadmoor Trophy to keep their season going. As for the Playoff Champion I think if UMD is able to stay out of the penalty box and kill the ones they do take they are primed to win the tournament. I am going to pick UMD to beat North Dakota in the Saturday final.